Starboard Big Easy Paddle Board, Big Easy SUP, Big Easy Paddle Board, The Big Easy, Beginner Paddle Board, Big Paddle Board. The Big Easy by starboard paddle boarding is one of the most versatile boards we sell. If your a beginner or a heavier rider this is the board for you. The Big Easy has increased stability, benefiting from its 32 width, making it the perfect paddle board for learning or family fun. Due to the increased tail rocker and pinned out aft section of the big Easy, you will be pleasantly surprised by its maneuverability. Like the entire Starboard SUP lineup, the Big Easy comes in 4 different technology choices and price levels. 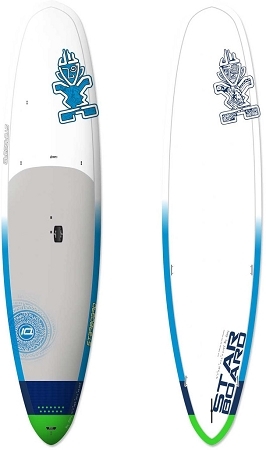 The 2015 Electric Blue construction comes with built in tie down locations on the front of the board, side fins near the middle of the board for better windsurf tracking & features an integrated mast base to add a windsurf rig. Buys this as the ultimate wind/paddle package by adding the Aerotech WindSUP sail rig and we will throw in an free adjustable paddle! Two sports for one price!! !